In a local referendum residents of Baranów voted against construction of a multi-modal transport hub on over 66 square kilometers of villages and farmland. Plans for the Central Transport Hub include an airport, airport city, road and rail infrastructure. On 7th November 2017 the Polish government approved a plan to build a new mega-airport, called Poland Central Airport or New Central Polish Airport. The location was confirmed to be near Stanisławów village, in Baranów, a rural gmina (administrative district) between Warsaw, Poland’s capital city, and Łódź, Poland’s third largest city and a former textile manufacturing hub. A new airport on a site between Warsaw and Łódź, had been the subject of debate since 2006. 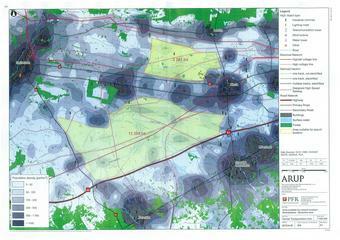 A 30 square kilometre site is earmarked for the airport, within a larger project area of 66.2 square kilometres. The area allocated for the new airport is characterized by villages and small parcels of cultivated land. Stanisławów, Baranów and several other villages stand to be affected. Baranów is a small village with its church spire jutting above apple and pear groves. The airport, with an adjoining ‘airport city’, is a key component of plans for a larger megaproject, a multi-modal transportation hub, initially called Centralny Port Komunikacyjny (CPK) or Central Communication Port, integrating the new mega-airport with existing and new road and rail infrastructure. In April 2018 the name of the project was confirmed as Central Transport Hub. Affected local communities raised concerns over the future of their land ownership. New legislation to enable implementation of the Central Transport Hub results in de facto freezing of their real estate, establishing a Special Purpose Vehicle (SPV) called Central Transport Hub LLC with pre-emptive powers over land development decisions and superseding local spatial development plans. In effect, provision has been made for land required for the project to be expropriated automatically, with provisions made for compensation. When the legislation pertaining to the Central Transport Hub was approved, in May 2018, Baranów residents said they had not been officially informed about their future including the terms upon which the government would buy their land. A referendum to determine whether they support the airport plans was announced. A large protest against the airport project took place on 23rd May 2018. 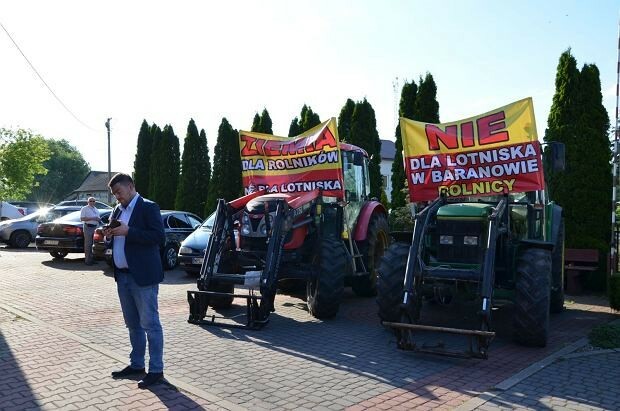 Residents, accompanied by a few tractors, gathered in front of Baranów fire station where a meeting was held with Deputy Minister of Infrastructure Mikolaj Wild and a representative of the consulting firm Arup. A map produced by Arup of the entire area that would be taken up by the Central Transport Hub, including the new airport, airport city, road junctions and railway lines, showed an area of over 66 square kilometres in total. 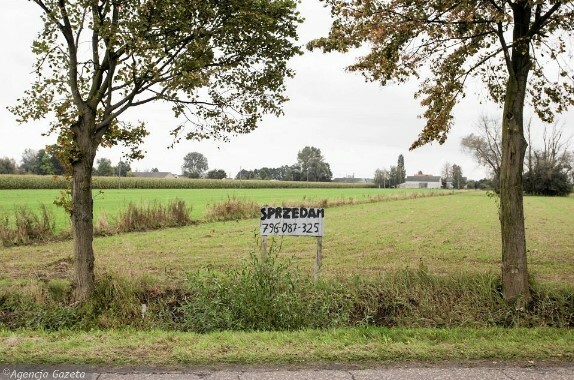 Councillors voted to hold a referendum on the airport, asking residents two questions: whether they agree to the location of the project in Baranów and whether they agree to the settlement terms proposed by the government. In June 2018 the Central Europe Legal News and Views Blog stated that enactment of the new legislation regarding the Central Transport Hub, signed into law by President Andrzej Duda, had caused an ‘outcry’ in the community of Baranów and anticipated ‘intense’ local resistance. 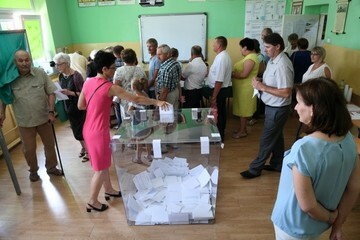 The referendum on the issue, consultative rather than binding, was scheduled for 17th June. The result of the referendum was a resounding vote against the project: 88.2 per cent of the votes were against the Central Transport Hub and a mere 17.2 per cent voted in favour of it. Residents also rejected the government’s proposed settlement terms for acquisition of their land. Opposition to the project due to concerns over serious socio-economic disruption is accompanied by widespread doubts over its economic viability. The airport along with the transportation hub would be the biggest infrastructure project in the history of Poland. The European Union (EU) is not expected to contribute funds and the European Commission monitors airport projects to ensure compliance with state aid rules. The Polish government has claimed Chinese, South Korean and Singaporean interest in investing in the project but as as of October 2018 there was no report of commitment from a foreign investor. With the first phase of the project projected to cost about USD8 billion, more than 10 per cent of Poland’s annual budget for 2018, skeptics were of the opinion that the money allocated for the new airport would be better spent on highways, railways, and upgrading the existing Warsaw Chopin Airport. Marcin Swiecicki, former Mayor of Warsaw and member of Parliament for Civic Platform, Poland’s main opposition party, said: “I see more megalomaniacal self-aggrandisement than any realistic analysis in this project”. Project Details Preparatory works on Poland Central Airport are scheduled for 2019, then for construction to be complete in time for commencement of operations to commence by mid-2027. A mega-airport is planned, one of the largest in the world with four runways, initially serving 45 million passengers per year, rising to 100 million. Large volumes of cargo traffic between Europe and Asia are also planned. Envisaged as a key component of a larger mega-project, a multimodal transportation hub called the Central Communication Port, the airport would include a rail station and be integrated with existing and new road and rail infrastructure. A high-speed rail line connecting the two cities of Warsaw and Łódź is planned and the rail line between Berlin and Moscow, providing a high-speed service via Warsaw that commenced operations in December 2016, is immediately north of the proposed airport site. The A2 motorway running between Poland’s western and eastern borders is immediately south of the proposed airport site. Plans for an estimated 248 kilometres of new and expanded road infrastructure include extension of the A2 motorway along with numerous ring roads. In April 2018 the name of the project was confirmed as Central Transport Hub. A 3,000 hectare land area has been earmarked for the new airport and an adjoining ‘airport city’ with hotels and showrooms is planned, covering 1,200 hectares. Construction of business parks, conference centres, an exhibition centre and office complexes was allowed under the government resolution outlining plans for the new airport along with legal and infrastructural changes in Baranów. The airport city is expected to accommodate 100,000 workers. Agglomeration of the new airport city, Warsaw and Łódź is anticipated to create a global metropolis. The total project area for the Central Transport Hub is 66.2 square kilometres. The 7th November 2017 resolution announcing construction of the airport approved the financing structure. The estimated cost of the airport is USD7,172,402,000. An article in Airport Development News, the newsletter published by Airports Council International, stated that two state-owned financial institutions, Polish Development Fund (Polski Fundusz Rozwoju – PFR) and Bank Gospodarstwa Krajowego (BGK), Poland’s national development bank, would be ‘heavily involved’ in financing the airport. If the main investor is indeed the government Polish citizens will bear the cost and risk of the airport project. The implementing legislation specifies the special purpose vehicle (SPV), 100 per cent owned by the State Treasury, as the investor in Central Transport Hub. According to legal analyst firm Lexology the total cost of the rail infrastructure elements of the multimodal hub is estimated at USD2.1-2.3 billion whilst the total cost of roads and highways is estimated to range between USD482 million and USD1.86 billion. Lexology stated that the road and rail elements of the project might be eligible for EU funding. Some industry experts are critical of the new airport, doubtful that a new global hub could compete with established European hub airports such as Schiphol and Frankfurt and predicting that it would struggle to meet its traffic projections. There are concerns that a major new hub airport would compete with regional airports, possibly leading to closure of some of these facilities. Expenditure on a new airport precipitating closure of established regional airports would be a profligate waste of public funds. Between 2007 and 2015 at least USD1.58 billion was spent on building and expanding 14 Polish regional airports, with 40 per cent of this funding coming from the European Union (EU). Poland’s state-owned carrier, LOT Polish Airlines, is a proponent of the new airport. Indeed, supporting growth of LOT, in order for it to become one of Central Europe’s main carriers, is part of the rationale for the airport project. The new airport is key to LOT’s plans to triple passenger traffic with a focus on increasing the number of long-haul flights to Asia and the Americas. In 2018 the Polish government established a new aviation group, Polish Aviation Group (PGL) based on LOT. The assets of Poland’s largest aviation service providers: LOT Aircraft Maintenance Services, ground service provider LS Airport Services and aircraft repair firm LS Technics were transferred to LOT. Officials said the consolidation aimed to capitalise on the growing air travel market and the new hub airport. In the interim between announcement of the establishment of Polish Aviation Group in January 2018 and commencement of operations in November 2018 the capital endowment increased from USD350 million to USD670 million. Development of Alternatives Some critics of the airport project argue that the money allocated for it would be better spent on highways, railways, and upgrading the existing Warsaw Chopin Airport.